At the invitation of Foreign Minister Wang Yi, Minister of Foreign Affairs and International Cooperation Nasser Bourita of the Kingdom of Morocco will pay an official visit to China from November 16 to November 17. The two sides attach high importance to Foreign Minister Bourita's first visit to China since he assumed office. 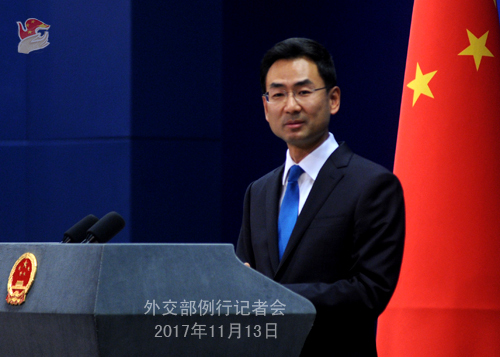 During the visit, Foreign Minister Bourita will meet with Chinese leaders and hold talks with Foreign Minister Wang Yi. The friendship between China and Morocco goes back a long way. In the past 59 years since the establishment of diplomatic ties, the two sides have seen their bilateral ties grow in a sound and steady way, with deepening political mutual trust and expanding economic and trade cooperation. The bilateral relationship stood at a new historical starting point when it was elevated to a strategic partnership in 2016. We hope to, through this visit, thoroughly exchange views with the Moroccan side on bilateral relations and international and regional issues of mutual interest, consolidate our consensus, deepen our cooperation, enhance our friendship, and strive for better and faster development of the China-Morocco Strategic Partnership. Q: The meeting between the heads of state of China and the ROK last weekend agreed that efforts shall be made to bring the China-ROK relations back to normal, and the ROK President Moon Jae-in will visit China next month. What is China's position on it? A: On the sidelines of the APEC Economic Leaders' Meeting in Da Nang, Vietnam, President Xi Jinping met with President Moon Jae-in. Since China has issued a press release and the ROK side has also given a press briefing on that meeting, I will not repeat the details of it. As for President Moon Jae-in's visit to China, I want to say that leadership-level interactions play a significant role in guiding the development of China-ROK relations. We will let you know when we have any information on that. Q: When addressing the APEC CEO Summit, President Xi Jinping said that China would continue with its efforts to establish an FTAAP. In the APEC Da Nang Declaration, the APEC members also reaffirm their commitment to advance toward the eventual realization of an FTAAP. Considering the latest developments that some countries have agreed on framework agreement on CPTPP, how does China think of the prospect of an FTAAP? A: The 25th APEC Economic Leaders' Meeting was just wrapped up. In the Da Nang Declaration adopted at the meeting, leaders of the APEC members reaffirm their commitment to advance in a comprehensive and systematic manner the process toward the eventual realization of an FTAAP to further APEC's regional economic integration, and foster a shared future of a peaceful, stable, dynamic, inter-connected and prosperous Asia-Pacific community. The 2014 APEC Economic Leaders' Meeting in Beijing launched the process of building an FTAAP with the adoption of the Beijing Roadmap for APEC's Contribution to the Realization of the FTAAP. The 2016 APEC Economic Leaders' Meeting in Lima charted the course for the future work and consolidated the advancing momentum of building an FTAAP with the adoption of the Lima Declaration on FTAAP. This time, the Da Nang Declaration sends yet another positive signal from the APEC members on moving forward the FTAAP process, which will help cement the cooperative momentum of APEC, maintain the general direction toward openness and development of the Asia Pacific, and inject fresh and positive energy to an open world economy. To establish an FTAAP is a key instrument to deepening regional economic integration, developing an open Asia-Pacific economy, and fostering an Asia-Pacific community of shared future. It serves the common interests and long-term development needs of all sides. China stands ready to work with other sides to fully implement the consensus reached thus far and make steady efforts in all related areas so as to reach the goal of establishing an FTAAP at an early date. Q: The UN Climate Change Conference is now underway in Bonn, Germany. It is reported that Lee Ying-yuan, head of the Chinese Taipei delegation and also the so-called "minister of the Environmental Protection Agency of Taiwan" was denied access to the conference because of intervention from the Chinese mainland. What is your response? Second, Soong Chu-yu (James Soong), representing the Chinese Taipei at the APEC meeting, shook hands and talked with President Xi Jinping on November 10 in Da Nang, Vietnam. Can you confirm it? A: On your first question, I think you must be very clear with our consistent and clear position on Taiwan's participation in international activities, which is that the one-China principle must be observed. On your second question, Taiwan's participation in APEC must accord with the one-China principle and the relevant APEC MOU. I want to stress that the improvement of the cross-Straits relations must be based on adhering to the 1992 Consensus which reflects the one-China principle. The Taiwan authority's denial of the historical fact of the 1992 Consensus and refusal to recognize that the mainland and Taiwan belong to one and the same China, has created some obstacles for interactions between the two sides. Q: The ROK government says that the Chinese government has ended its unofficial ban on ROK cultural imports that were in place because of the THAAD issue. With the agreement between China and the ROK on improving relations, what is the outlook for cooperation culturally and in the entertainment industry between China and the ROK? A: I have never heard of the so-called 'cultural ban' as you described in your question, and therefore there exists no such a thing as "lifting the ban". As for China-ROK relations, like what I just said to the Yonhap News, the two sides have released information regarding the meeting between the two leaders in Da Nang, Vietnam. The two sides agreed in their meeting to overcome obstacles as soon as possible to move forward China-ROK relations in a sound and steady way. Upholding this spirit, China is willing to work with the ROK to steer all-around exchanges and cooperation back to the sound track at an early date. Q: Japan and the US have recently talked a lot about the Indo-Pacific strategy, expressing their hope to establish leadership-level strategic dialogue mechanism for the US, Japan, Australia and India. The four countries have already held a director-general-level meeting on the sidelines of the leaders' meetings on East Asia cooperation. Today, Japanese Chief Cabinet Secretary Yoshihide Suga said that if the Indo-Pacific strategy gains wider approval, Japan would like to work with all sides, including China, to cooperate on this strategy. What is your comment? A: We have taken note of these developments and the latest statement made by the Japanese side. It is the shared responsibility of all regional countries to promote stability and prosperity in the Asia-Pacific. We hope that the policies and actions of relevant parties would correspond with the trend of the times that calls for peace, development, friendship and cooperation, and serve to maintain and promote regional peace, stability and prosperity. Q: US President Trump tweeted on Sunday that President Xi told him that he is upping sanctions on the DPRK. Can you confirm whether that is the case and if so, give us more details on what those sanctions may be? A: China's position on the Korean Peninsula nuclear issue is consistent and clear. We are committed to achieving denuclearization of the Peninsula, maintaining peace and stability of the Peninsula, and resolving the issue through dialogue and consultation. Meanwhile, China has been comprehensively, accurately, faithfully and strictly implementing DPRK-related resolutions adopted by the UN Security Council and fulfilling its international obligations. At present, the situation on the Korean Peninsula remains a complicated and grave one. We hope that all relevant parties play their due role, shoulder their due responsibilities, and make concerted efforts to ease the tense situation on the Peninsula and bring the Peninsula nuclear issue back to the right track of settlement through negotiation at an early date. Q: You spoke about Japan's reaction to the concept of the Indo-Pacific region. This new concept has taken shape in the form of a quadrilateral meeting between India, Japan, US and Australia and has been clarified by several American and Japanese officials. So, I would like to have your reaction on how China looks at this concept. A: Peaceful development and win-win cooperation is the call of the times and the global trend. All countries and regions should heed this call and ride with this trend, and the visions and proposals on regional cooperation raised by any party are no exception. Besides, these visions and proposals should be open and inclusive and conducive to enhancing win-win cooperation. Politicized and exclusionary ones should be avoided. Q: Speaking in Vietnam, President Trump offered to help to mediate the South China Sea issue. What is China's comment? 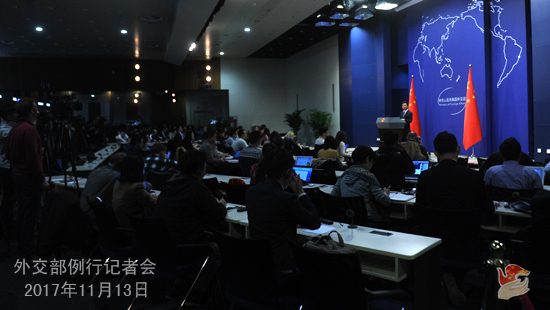 A: China's position on the South China Sea issue is consistent and clear. 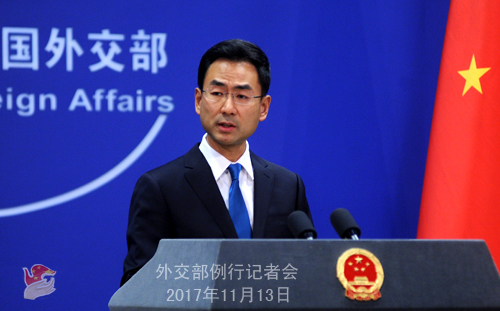 China is resolute in safeguarding its territorial sovereignty and maritime rights and interests in the South China Sea. 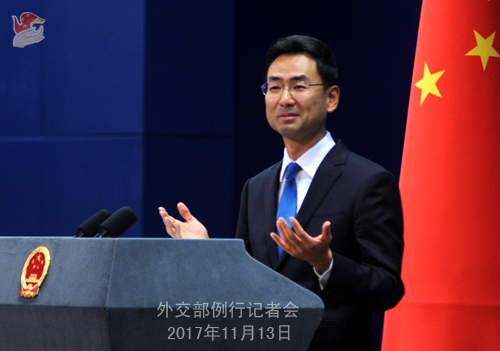 Meanwhile, China is committed to resolving the relevant disputes with countries directly concerned through dialogue and consultation and firmly maintaining peace and stability in the South China Sea. At present, thanks to the concerted efforts of China and ASEAN countries, the situation in the South China Sea is generally improving. We believe that regional countries have the aspiration, wisdom and capacity to properly deal with the South China Sea issue. Meanwhile, we hope that countries outside the region respect the efforts made by regional countries to maintain peace and stability in the South China Sea and play a constructive role in this regard. Q: About the Indo-Pacific strategy, you said that there should be no politicizing and excluding third parties. Do you mean China is being excluded? A: Just now I was talking about our position from the consistent foreign policies China upholds. We keep saying that China is glad to see relevant countries develop friendly and cooperative relations, but we hope that such relations would not target a third party and should contribute to regional peace, stability and prosperity. And this principle and policy is applicable to all new initiatives and proposals. Follow-up: Do you see a difference between the idea of the Asia-Pacific and the Indo-Pacific? Is there a contradiction? A: You seem to be too obsessed with the concept of the Asia-Pacific or the Indo-Pacific. As I just said, the development of all countries and regions, be it the Asia-Pacific or others, shall heed the call of the times for peaceful development and ride with the trend of the world for win-win cooperation.